Tim Kaine may no longer be Hillary Clinton’s running mate, but he can’t seem to help repeating his former boss’s lies. On Monday the Virginia senator asserted in an interview with the Washington Post that Las Vegas shoot Stephen Paddock only stopped shooting because he lacked a “silencer”. “He only was stopped finally because he didn’t have a silencer on his weapon,” Kaine told the Post. “And the sound drew people to the place where he was ultimately stopped. 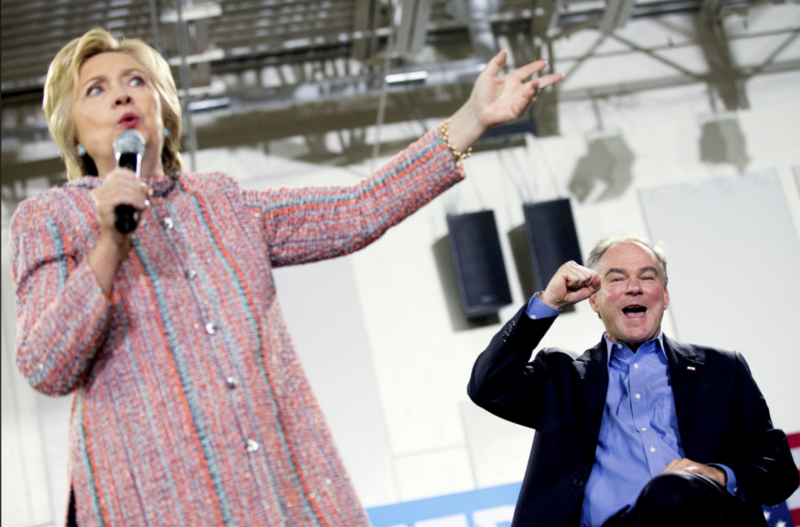 Can you imagine what this would have been if he’d had silencers on these weapons?” Kaine asked. Kaine was quickly called out for his false assertion, forcing his office to clarify that he didn’t actually mean to suggest that so-called “silencers” [known as suppressors to those of us who actually know anything about firearms] actually silence. But even the liberal Washington Post didn’t appear quite convinced, giving Kaine “Two Pinocchios” for his misleading comments. “Kaine should be more careful when talking about weapons, especially during a national tragedy,” writes Glenn Kessler. “We will accept his staff’s explanation that he meant that silencers muffle a gunshot’s source, even though his phrasing certainly sounded like he meant that silencers actually made firearms quiet,” Kessler wrote. “In any case, the evidence does not support Kaine’s claim that the shooter was ‘only stopped’ because he did not have suppressors on his weapons. That’s exaggerated and could leave a misleading impression on people only familiar with silencers in the movies,” continued Kessler. Will Hillary's lies ever end? Kaine’s comments echo a tweet sent by Clinton on Monday. “Imagine the deaths if the shooter had a silencer, which the NRA wants to make easier to get,” she tweeted. 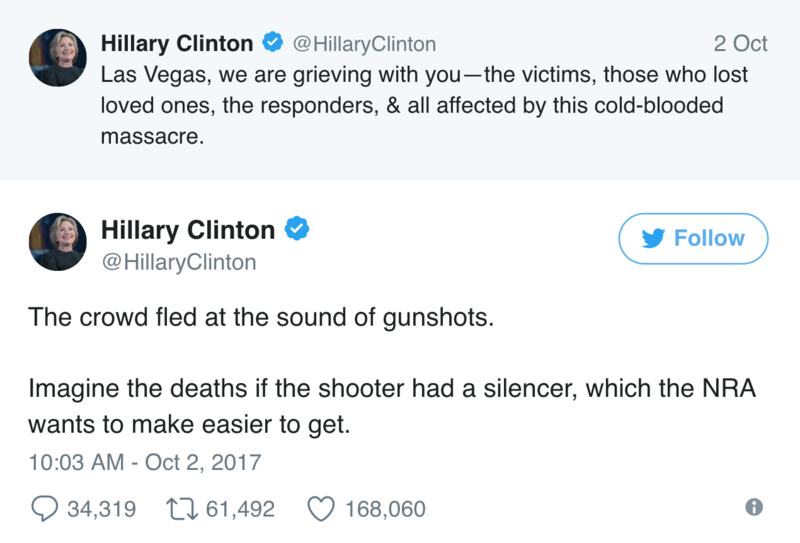 The absurdity of Clinton’s tweet was only amplified when only one minute later she tweeted that we shouldn’t politicize the Las Vegas shooting — while literally politicizing the Las Vegas shooting. “Our grief isn’t enough. We can and must put politics aside, stand up to the NRA, and work together to try to stop this from happening again,” she tweeted. Clinton’s most famous catchphrase might be “what difference does it make?” — but it’s clear from her performance this week that her true motto is never let a terrible tragedy interfere with politics. Clinton and Kaine should be ashamed of their blatant exploitation of the Las Vegas shooting for political gain.